Consul General Franz Hall has been with the Ministry of Foreign Affairs 23 years, assigned to various locations. He discovered that while he may have particular ideas about places before arriving, he needed to take the first few months to learn the new location and then set goals. Mr. Hall has been serving as Jamaican consul general in Miami for almost a year and a half. 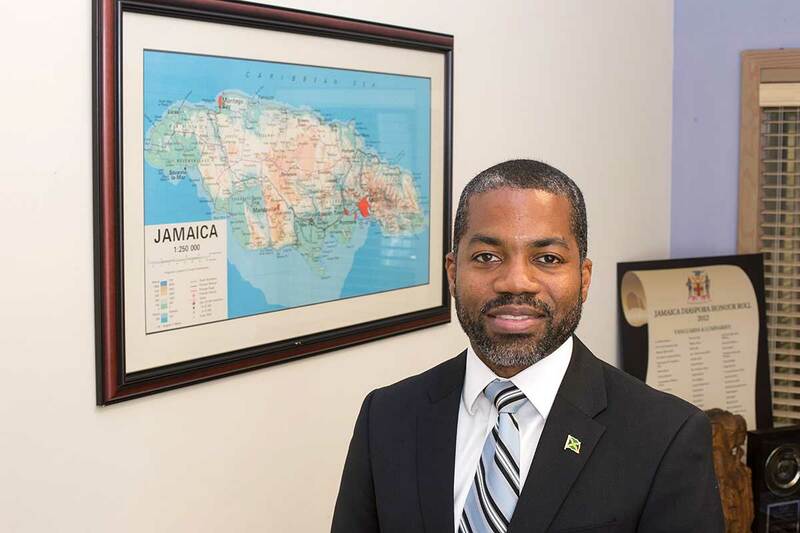 Once he established “realities on the ground,” he set a number of goals, including making connections with the large Jamaican population in South Florida as well as with 12 other southern states for which the consulate is accredited. It’s extremely important to Mr. Hall to communicate that Jamaica is more than a tourist destination. He cites opportunities for trade, for investment and to have a vibrant commercial relationship with the US. So – in between the hours he spends supervising the consulate directly, traveling to meet people in his vast territory and participating in community events – Mr. Hall partners with the Jamaica US Chamber of Commerce and reaches out through conferences such as the upcoming Sixth Biennial Jamaican Diaspora Conference and various campaigns to make sure business is generated for Jamaica. Miami Today reporter Susan Danseyar interviewed Mr. Hall in the Jamaican Consulate in downtown Miami.